With humbucker, P-90 and piezo sounds on board, the Elise isn't short of sonic options. The Elise is based on the Vintage AV3H, but offers a real step-up. The treble side is pulled down slightly. Vintage's AV3H impressed us on its release and this Fret-King version is even better. Basically, the two-piece, centred-joined mahogany back is routed out to leave a centre block that runs just beyond the stud tailpiece - the rest is hollow. It's capped by a solid maple top - very unusual at this price point - carved inside and out, then faced with a figured maple veneer. At 368mm (14.5 inches), wide and 450mm (17.75 inches) long, its smaller than an ES-335 and, of course, the treble side is pulled back, offsetting the horns and the waist. A major difference, visually at least, is the six-in-a-line back-angled headstock, giving a Gibson Trini Lopez vibe. It looks better than the bulky 'stock on the AV3H in our opinion. Aesthetics asides it's a complex guitar to make and that's before we get to the equally complex electronics housed under an over-sized inset backplate. 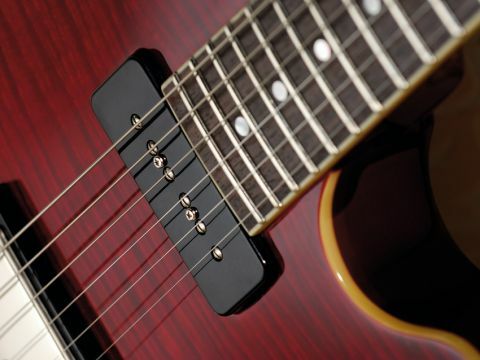 We have three pickup sources: the two Wilkinson magnetic pickups and the piezo elements of the tune-o-matic-style bridge that, like most hybrids, aims to provide an acoustic-like tonality to contrast and complement the conventional magnetic tones. Control of the passive magnetic pair is straightforward with a three-way toggle pickup selector, master volume and tone. The active piezo circuit is more involved with a volume and three-band EQ from three separate, centre-notched rotary controls. Finally, a three-way mode switch enables magnetic or piezo individually or both together. The output is a single jack that with a mono lead mixes both sources to the same amp or with a stereo 'Y' you can output the two systems to separate amps. It's very tidily constructed and a good weight. The neck has a similar profile to the DBC, although here it's very a tad asymmetric feeling slightly bigger on the bass-side. And despite the plethora of controls, it's pretty obvious what's what. The smaller centre-notched knobs operate the EQs, the regular knobs the volume and passive tone, the piezo volume being the lowest of the three. Telltale details such as how clean the body and fingerboard binding is and fret ends are all very ship-shape, likewise the very tidily bound f-hole. Fret-King has established a reputation for quality and these, just like the JD we looked at last year, don't let the side down at all. The Elise looks and sounds a little bit sophisticated. The humbucker has a nice hotter-than-PAF-like output, a little more aggressive in the high end, but the neck single-coil is very much in the 'hot Strat' camp and played clean there are a host of older sixties tones here, some smooth jazz or way more contemporary arpeggios that work effortlessly with our pedalboard. There's a nice fat fullness to the overall sound, which is more woody than a standard ES-335 style. Edging up the wick, electric blues and more forceful jazz fall out of the guitar. If you know your sounds and how to get 'em, this guitar will suit pretty much anything, with perhaps with the exception of clinically clean country Tele twang and all-out metal. The quality of the piezo sound is acceptably acoustic-ish, certainly good enough to add texture to the magnetics when, for example, run through an acoustic combo; good enough certainly for a hybrid jazz tone, less acceptable for a strummy acoustic intro and pretty much a no-go if you need to do an acoustic gig and this is the only guitar you have. Along with what are clearly a couple of pre-production glitches on this sample, there's also a high frequency, almost out-of-phase 'halo' to the sound that doesn't do the tonal quality any favours. That said we got some very usable hybrid sounds running both signals into a clean-ish Fender-style combo where the piezo adds a different, certainly acoustic-like, texture. Potentially, it's a very powerful machine but be prepared to do a little work to get the most from the piezo side. Giltrap's Elise is a bold guitar that,so long as the piezo hiccups are sorted by the time it hits the stores, is a lot of guitar for the money - a really neatly designed and excellent sounding electric guitar with some acoustic-like colour. You'd be foolish not to audition this - and the rest of the Black Label range.